Nowadays there are many different log splitters, such as electric log splitters, and hydraulic log splitters, as well as many other wood splitters. A petrol log splitter, however, is also a great option for homeowners who need to chop wood at home. Choosing the right model for your home can be a challenge. However, if you invest a little time and research, it will save you frustration in the long run. What are the five best petrol log splitters on the market right now? The Titan Rhino 30 is the newest petrol log splitter from the Titan Pro company. It’s efficient and effective and the towing feature makes it easy to move with your ATV. It comes with a jockey wheel and 50 mm tow hitch and safety change to make moving save and easy. It features a swivel bed and gives you horizontal and vertical splitting capabilities. There is an optional 4-way splitting ax head available to make the splitter even faster. There are two engine options available in this petrol log splitter. You can choose the economical Lifan single cylinder diesel engine or opt for the Lifan 420cc OHV petrol engine. Each is reliable and comes with a full Titan Pro back-up for all spares and services. This is the biggest petrol towable log splitter available from Titan Pro. The Handy Pro THPLS7TP is capable of splitting logs up to one meter in length. It features 7 ton splitting force and is powered by a 6.5 HP I/C 65 Engine from Briggs & Stratton. There is an adjustable base plate that makes it easier to split logs of different sizes. This petrol log splitter is quiet and easy to use and owners love it for its efficiency. It features upright operation and gripping jaws and its transport wheels make it easy to move. It has an option of coming equipped with a 4-way wedge that enables you to split logs into four instead of two pieces. The Titan Pro 10 Ton Vertical Petrol comes with a two-way ax head and features a Lifan 8 HP engine. It’s splitting force is 10 tons. This log splitter operates at maximum revs at all times, which means you’ll be dealing with optimum power. It’s considered a workhorse and can really save a lot of time. It’s powerful enough to function for commercial use, but can work as a great at-home log splitter, too. 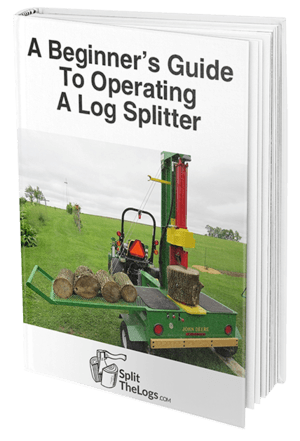 This safe and easy to use splitter can split wood down to the base and balance logs on its base for splitting. The distance ram travels to chop is greater on this log splitter than on the Petrol 8 Ton, which means it chops with more power and force. It also has an axe head that’s bigger than the Petrol 9, so it’s able to deal with bigger logs than the 8 Ton. This log splitter operates quietly and can cut through green wood like butter. The Ryetec P08-6PDP Petrol Log Splitter features 8 ton splitting force and a Subaru Benz 6 HP 4-stroke engine. It can handle everything from heavy domestic to light professional use, so it’s perfect for at-home use. It features a twin pump system that gives you both speed and large capacity splitting. Its oil tank is large enough that it allows for continuous use without having to worry about overheating. The Ryetec P08-6PDP features high-quality hydraulic components that make it reliable and efficient. Its splitting action is controlled by two levers that are also grips for the logs. It can be set to split lengths of 55, 76, and 103 cm and features a 1 m diameter splitting capacity. The Titan Pro Petrol 8 Ton is throttle operated and features a two-way splitting ax head to help you chop as effectively as possible. This splitter is equipped with a Lifan 6.5 HP engine and offers splitting force of eight tons. It offers a lot of value for the investment and features three cutting levels: From the base, middle, and the top, so you’re able to split into a variety of sizes. The Titan Pro 8 Ton is efficient and great for at-home use and offers safe, easy, and quiet operation.